Pies with top crusts get all the glory. 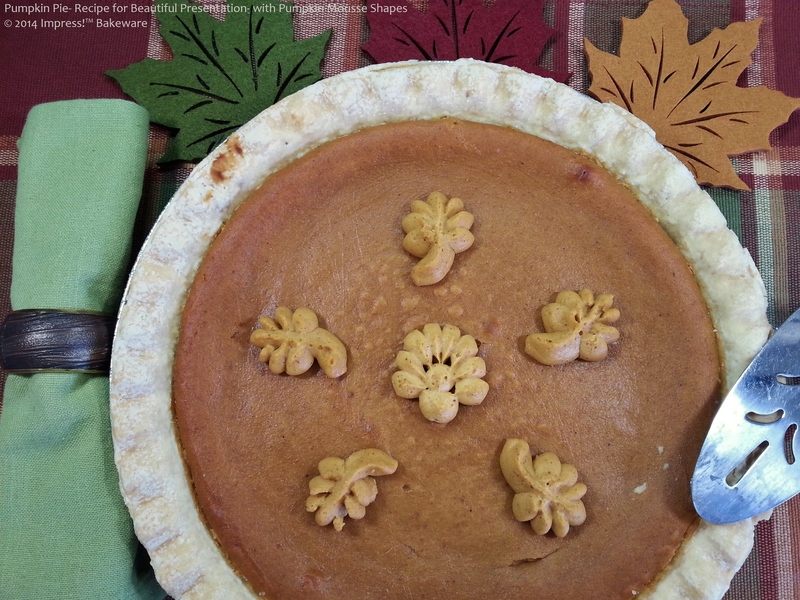 Crumbled dutch apple toppings, lattices of pie crust dough and fun patterns cut and stamped adorn many a holiday pie. But what about plain old pumpkin pies? When do they get to be jazzed up, other than the occasional spray or blob of whipped cream? 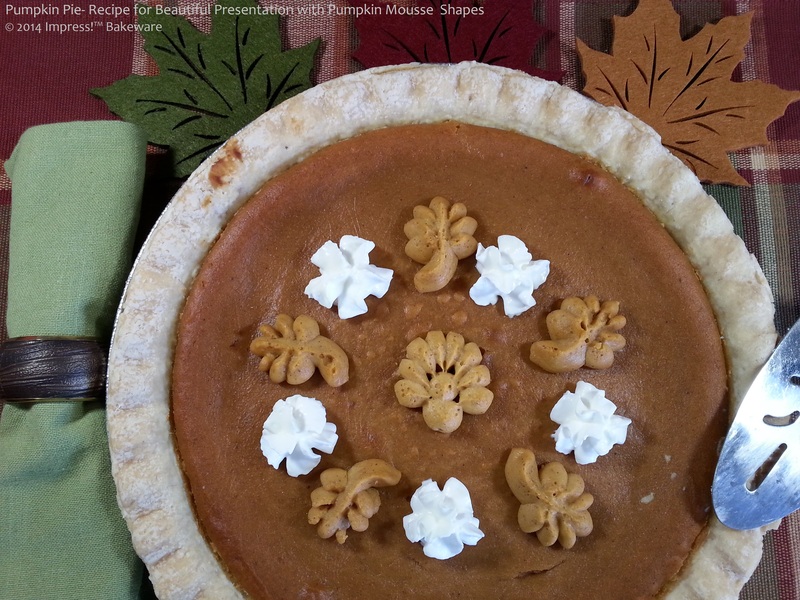 So here’s how to make the pumpkin mousse shapes. 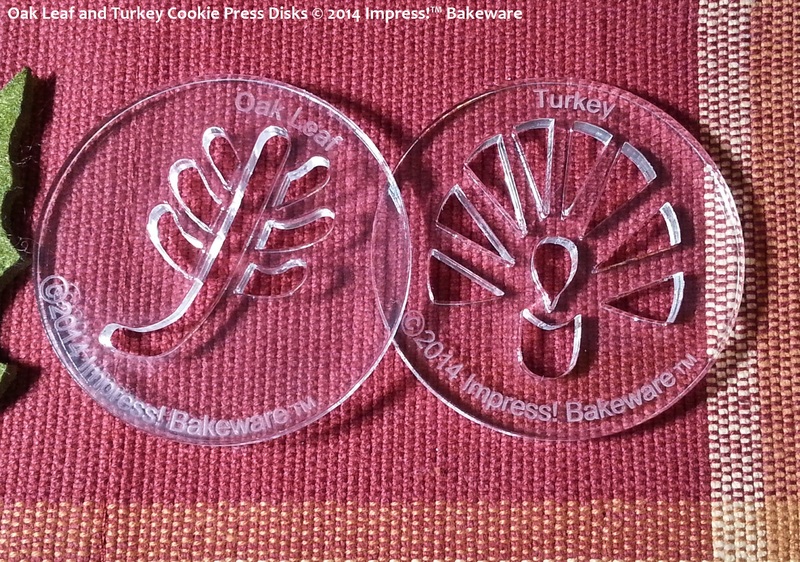 You will need a cookie press and disks of your desired shapes. Combine 1 tsp cinnamon, ¼ tsp nutmeg, ¼ tsp ginger and 1/8 tsp cloves. Use ½ tsp of this mix in the recipe. *SPECIAL TIPS for removing shapes. After pressing, place these shapes in the freezer until firm enough to remove with a wet spatula. It’s easiest to let the cold cookie sheet sit for 3 to 5 minutes, just long enough for the shapes to “let go” of the sheet more easily. If they become too warm and lose their shape as you lift them simply return them to the freezer for a bit then try again. Once you get the hang of this technique, it’s easy! Experiment with a couple of these techniques and see what works for you: wipe the end of the spatula between lifting each shape, try buttering the end of the spatula or dipping it in or running it under warm water. Sometimes keeping it slightly wet helps the shapes lift. Also keep your fingers slightly wet when handling to avoid sticking. Now garnish your pie as you please! It can be just as gloriously beautiful as any top-crust pie. 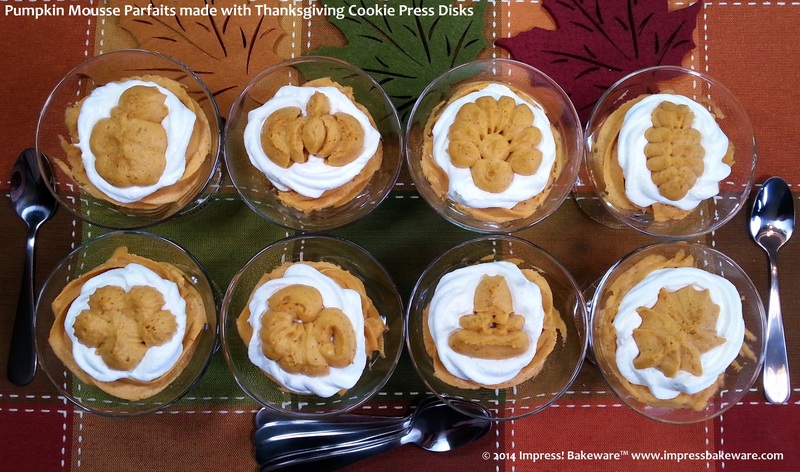 If you have leftover shapes, make Pumpkin Mousse Parfaits! Spoon (or pipe through a decorating bag) the remaining mixture into single serving cups or bowls, alternating layers with whipped cream or whipped topping. Place shaped mousse as garnish on top of the parfaits. For these parfaits I pressed the entire Thanksgiving disk set. Enjoy! Happy Holidays and Happy Pressing!